FXCM receives mixed scores for the key criteria. It has a wide range of services and interfaces. However, FXCM has had serious regulatory action against it by the CFTC and the NFA, and has been banned from operating in the United States. There are other forex brokers with strong service offerings and a much better regulatory record. Unlike most other review sites, Forex Scam Alerts does not receive any financial compensation from FXCM. Don’t open a FXCM account before reading more below about their critical flaw. FXCM is a large online forex broker serving customers all over the world. The company was founded in 1999, and trades on the New York Stock Exchange under symbol FXCM as of 2010. Major offices are located in New York, London, Berlin, Sydney, Paris, Milan, Tokyo, Athens, Hong Kong, Toronto, Tel Aviv, Santiago and Johannesburg. NOTE: In February 2017, FXCM was permanently banned from the United States, and fined $7 million for multiple and significant regulatory violations. Forex Scam Alerts warns potential clients against doing business with FXCM. Just because FXCM has not had regulatory action taken against it in your country, it does not mean you are safe. United States: FXCM under Forex Capital Markets LLC is regulated by the CFTC and NFA in the United States under NFA #0308179. The money you deposit with your broker has no regulatory protection. This makes it important to choose a broker with high financial strength. Marketing materials cannot be misleading. This is important because in most other countries the marketing materials on the website are misleading. Forex brokers can make price adjustments after the trade has closed, under certain circumstances. Although some of these regulations may look bad for the forex trader, it is not usually very different than in other countries. The difference is that in the United States, the brokers must be honest and up front about their practices. FXCM Australia is required by ASIC to publish a Product Disclosure Statement (PDS), and Financial Services Guide (FSG). These documents provide prospective clients with information that describes exactly what products and services they would be receiving in plain English instead of lawyer-speak. Included are detailed descriptions of the risks that clients are taking on. This is very useful because it provides additional transparency by FXCM Australia. Signing up for FXCM Australia provides the additional benefit of the Financial Ombudsman Service (FOS). This service is provided by an independent third party to resolve complaints that clients have about their Australian forex broker. If a forex trader has a complaint, they must first attempt to resolve it with their broker. If the trader is unsatisfied with the outcome, they may make a complaint to the FOS. After hearing both sides, the FOS will issue a judgment, and this judgment is binding on the broker, if desired by the trader. This is an excellent mechanism to protect traders from any bad behavior by FXCM Australia. United Kingdom: FXCM under Forex Capital Markets Limited is regulated by the FCS in the United Kingdom under FCA #217689. France: FXCM under FXCM France Ltd registered with the Autorité de Contrôle Prudentiel (ACP) in France. FXCM has had several regulatory actions taken against it by the CFTC and the NFA. One such example in 2014 resulted in FXCM being fined $200,000 by the NFA. ​Some of the actions by FXCM that resulted in these regulatory actions were very serious. As such, we cannot recommend using FXCM as your forex broker. Generally speaking, FXCM acts as the counterparty to client trades. However, for “standard” or “active trader” accounts, FXCM finds a liquidity provider with which to offset the forex trades. For “Mini” accounts, FXCM acts as the final counterparty. That means that FXCM takes on all the risk from these trades. For CFDs, FXCM also acts as the final counterparty. Because FXCM acts as the final counterparty in these instances, there is a higher than normal risk that FXCM goes bankrupt. This is because FXCM is left more exposed to unusual events likes the Swiss Franc event of January 2015. In January 2015, FXCM had to take out a loan for $300 million from Leucadia National in order to be able to continue operating, because it had been significantly impacted by the Swiss Franc event. In the United States, FXCM is required to maintain minimum capital reserves in order to provide a cushion against unforeseen circumstances that could keep them from meeting their financial obligations to their clients. When last checked in June 2016, FXCM was maintaining capital reserves only 55% higher than what is required by regulations. Although this is adequate as far as the regulators are concerned, it is much less than the top brokers in this category. It should be noted that during the Swiss Franc crisis of January 2015, the capital reserves of FXCM dipped below the required minimums. Clients of FXCM in the UK have the benefit of access to the Financial Services Compensation Scheme (FSCS). This is a compensation fund of last resort to protect forex traders from losing their account balances in the event of FXCM’s bankruptcy in the UK. If bankruptcy proceedings do not return the full account balances back to clients, the FSCS will provide additional coverage up to £50,000 per trader. FXCM provides a STP, non-dealing desk environment for traders. With this straight through processing model, the result is similar to if the trader were trading directly with the liquidity provider. It also reduces, or completely eliminates the conflict of interest between FXCM and its clients. Generally speaking, these liquidity providers are very large banks with low risk of bankruptcy. FXCM also provide an option for using a dealing desk forex execution model, but this is not recommended. In addition to the spreads, FXCM charges a commission. This commission varies depending on the currency pairs being traded and the country you are trading from. 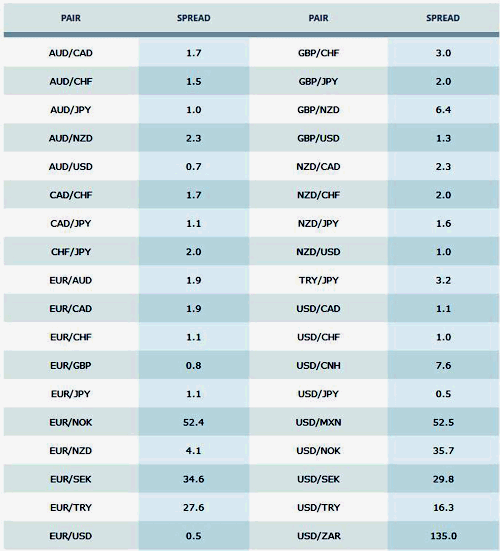 In most countries, for most of the major currency pairs, FXCM charges $4 per $100k lot. For other pairs, it is $6 per $100k lot. In Australia, FXCM charges $3 per $100k lot for the AUD/USD only. In the UK, commission are similar, except denoted in £. For frequent traders who trade very high volumes, substantial discounts are available on commissions. The commission charged by FXCM are not competitive compared to the leaders in this area, with the exception of high frequency traders, who are offered a much lower commission. FXCM charges no withdrawal fees, save for a customary and reasonable wire transfer fee, or fees associated with the 3rd party funding services. 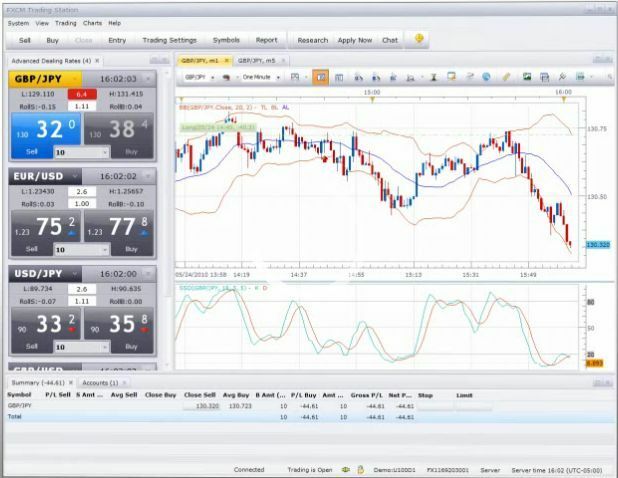 FXCM offers a demo account to run alongside the live account for testing strategies. FXCM offers a demo trading account of its Trading Station software, and it does not expire unless there has been 30 days of inactivity. Note that FXCM serves many countries, and the information provided her may not apply to your country. Risk disclosure: Trading foreign exchange carries a high degree of risk and is not appropriate for all investors. Using leverage to trade foreign exchange may result in being liable for losses that exceed the initial investment. Any potential investors of foreign exchange products should carefully consider their own circumstances to determine whether foreign exchange is a suitable investment for them. In case of any uncertainty, an appropriate financial advisor should be consulted.